I always put off taking down the Christmas tree and greens. I enjoy the light and the companionship and think how sad I will be when they are gone. My husband will say, "How about today?" and I'll answer, "Maybe tomorrow." And then one morning, I wake up and know it's the day. What amazes me every year is how much I love the newly open house. I don't miss the tree and its trimmings. I rejoice in the feeling of a fresh start. 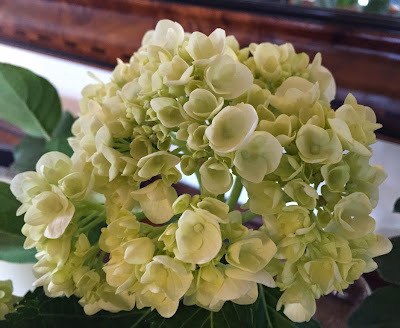 I celebrated by getting a few hydrangea from the florist. I wanted something white to reflect the purity and promise of this mid-January with its dusting of white snow and clear crispness.